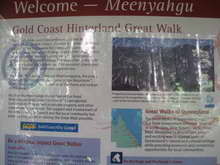 Gold Coast hinterland accommodation, tours and attractions, visitor information. Gold Coast retreats, Australian countryside. Beechmont, Numinbah Valley, 4211, Springbrook, 4213, Canungra, 4275, QLD. Gold Coast accomidation. Canungra Information Centre - ph. (07) 5543 5156. Still often referred to as the "Green behind the Gold", the Gold Coast Hinterland is the gateway to the SE QLD rainforests, ranging from Tamborine Mountain in the north to Lamington and Springbrook National Parks in the south. Accessible from the Pacific Highway at Nerang and Mudgeeraba on the Gold Coast, and via Chillingham and Numinbah from the Tweed Valley, the hinterland has attracted artisans and crafts people to live. Settlements at Beechmont, Canungra, Springbrook and the Numinbah Valley, originally timber, farming and dairying communities, have gradually given way over the years to hobby farmers and new settlers seeking a more relaxed lifestyle. Hint: Mouse over for external site description. External links open in a new window. With the influx of "treechangers" keen to share their experiences, visitors can choose from a wide variety of countryside accommodation including camp grounds, B&Bs, home stay, guesthouse, cabin style lodgings and cottages, many of which are original farm homesteads or refurbished workers dwellings. While the world heritage national parks are the primary attractions for many people, the winding roads with ample restaurants, cafes and arts and crafts outlets, can provide an interesting and scenic self drive discovery day tour. Numerous look-outs and road side stops along the way, offer stunning views and photo opportunities of the rainforest clad valleys and escarpments of the extinct volcano. Alternatively, you can let someone else do the driving (and talking!) and take advantage of the knowledge and years of experience that local day tour operators offer. Lamington National Park. Subtropical rainforest, magnificent views, waterfalls and colourful wildlife make this park one of the most popular in southern Queensland for day visitors. Green Mountains (O'Riellys) section is accessed via Canungra and Binna Burra section via Beechmont. Springbrook National Park consists of three distinct sections, each with their own features and charms. 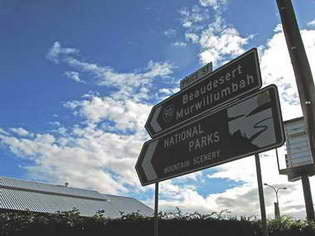 Springbrook Plateau and Natural Bridge sections are accessible from the Gold Coast via Nerang and the Numbinbah Valley, or 45-60 minutes via Murwillumbah and Chillingham, and Mt Cougal section via the Pacific Highway and Currumbin (see Tomewin/Currumbin). Natural Bridge is the southern most section and features a circular walking track through the rainforest to the "Natural Bridge" formation, where a waterfall plunges through the roof of a cave into a beautiful sun-dappled rainforest grotto. Springbrook Plateau. Waterfalls cascade over the spectacular cliffs in this section. Lookouts offer scenic views of mountains, canyons and coastline, with "Best of All" lookout being the most spectacular, offering stunning views over the Tweed Valley and Mount Warning, to the south. Getting here: Visitors can reach Gold Coast hinterland by road, with air services available at Gold Coast Airport. 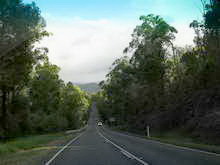 The Gold Coast hinterland is approximately 900 kilometres - about 11 hours drive north from Sydney, and approximately 100 kilometres - about 60 minutes drive south from Brisbane, via the Pacific Highway. Driving options include the Pacific Motorway via Nerang and Mudgeeraba in Queensland, and Pacific Highway via Murwillumbah, or the Summerland Way via Kyogle and Murwillumbah in New South Wales. Domestic flights operate from all capital cities to Gold Coast Airport at Coolangatta. A number of international carriers servicing SE Asia, New Zealand and the Pacific fly into Gold Coast Airport. Daily airport transfer services between Gold Coast Airport and Brisbane International Airport, are available to selected localities in the region. Gold Coast Airtrain services is one of the best ways to get to and from Brisbane International Airport. Trains leave every half hour or so, and you can buy your ticket at any Gold Coast railway station. Visit Gold Coast Airport Transfer Services for more local transport information. Daily interstate coach services are available from Surfers Paradise and Coolangatta, north to Brisbane and beyond, and south to Sydney and Melbourne. Daily or overnight train service operates from Sydney to Brisbane to connect with Sunstate Coaches at Casino in NSW. Alernatively, you can catch a train from Sydney to Roma St Station in Brisbane and then connect with the Airtrain train service south to the Gold Coast.